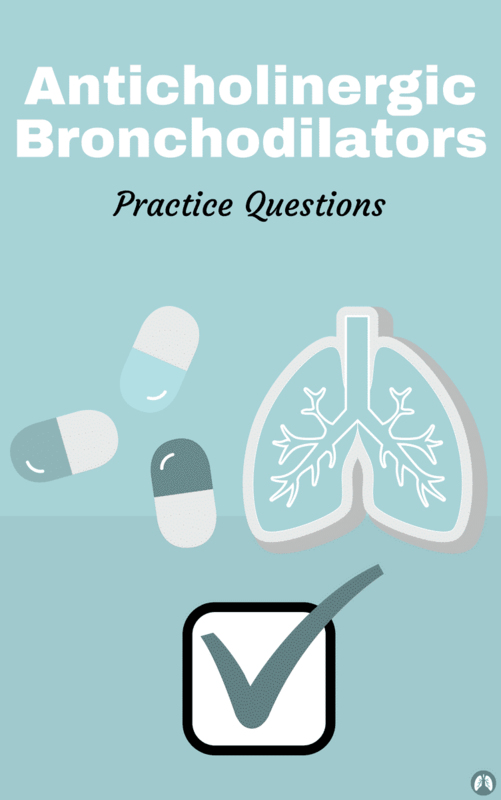 If you’re a Respiratory Therapy student looking for practice questions all about Anticholinergic Bronchodilators, then you’ve come to the right place. As a former Respiratory Therapy student myself, I realize how difficult it is at times to remember all the different drugs in Respiratory Pharmacology. This is especially true in regards to Anticholinergic Bronchodilators. So to help with that, we put together this study guide that covers everything you need to know about this drug class. Are you ready to get started? 1. What are other names for anticholinergics? Parasympatholytic, cholinergic antagonists, and antimuscarinic agents. 2. What do anticholinergics do? 3. What are the effects of anticholinergics? The speeding up of the heart and bronchodilation. 4. What is the parasympathetic effect? 5. What is the neurotransmitter for the parasympathetic? 6. How do anticholinergic bronchodilators work? They block the ACh receptor. 7. What does ACh cause? 8. What happens when a parasympatholytic (anticholinergic bronchodilator) is given? It blocks the effects of the PNS, by blocking ACh, and the effect, therefore, bronchodilation occurs. 9. Where is ACh released? The vagus nerve that innervates the trachea. 10. What does ACh, when combined with muscarinic receptors on the airway of smooth muscle, result in? 11. What is the result when ACh is combined with receptors on submucosal glands? 12. What aids in the breakdown of ACh? 13. What does parasympathetic innervation cause? 14. What blocks basal level bronchomotor tone? 15. On what does the degree of bronchodilation depend on? On the amount of parasympathetic tone present. 16. What kind of things stimulates the vagus reflex to cause bronchoconstriction? Irritant aerosols, cold air, high airflow rates, smoke, fumes and histamine release. 17. How can the vagus reflex, that causes bronchoconstriction, be blocked? By competitive inhibitors of ACh. 18. What is the brand name for ipratropium? 19. What is the brand name for tiotropium? 20. What are ipratropium and tiotropium indicated for? Maintenance treatment in COPD, chronic bronchitis, and emphysema. 21. What condition is Ipratropium indicated? 22. What type of condition are combination drugs (anticholinergic + beta agonist) are indicated for? 23. What are examples of combination drugs? Combivent or duoneb (ipratropium bromide/albuterol). 24. What are some parasympatholytic agents? Atropine sulfate, ipratropium bromide (Atrovent), tiotropium (Spiriva) and duoneb/combivent (Ipratropium bromide/albuterol). 25. What does the muscarinic receptor M1 cause? Secretion and rhinitis of the nose. 26. Are there changes in BP, EKG, or HR seen when using anticholinergic bronchodilators? 27. Is there worsening of ventilation-perfusion abnormalities seen when using anticholinergic bronchodilators? 28. Is there tolerance/loss of protection seen when using anticholinergic bronchodilators? 29. What side effects are commonly seen when using anticholinergic bronchodilators? Dry mouth (most common), cough, mydriasis (dilation of pupil of eye), and SVN: pharyngitis, dyspnea (SOB), flu-like symptoms, bronchitis and upper respiratory infection. 30. What two ways is atropine sulfate administered? 31. What is the duration of bronchodilation when using atropine sulfate? 32. What is the dose of atropine sulfate given to an adult? 0.05-0.10 mg/kg (actual weight not IBW!). 33. What is the dose of atropine sulfate given to a child? 34. What are the side effects of atropine sulfate? Dry mouth, blurred vision and tachycardia (increased HR). 35. Where is atropine sulfate mostly absorbed? GI tract and respiratory mucosa. 36. Is atropine sulfate readily absorbed? 37. What is the distribution of atropine sulfate? 38. What is atropine sulfate used for? Primarily for treating clinically significant bradycardia (decreased HR) and premedication before bronchoscopy. 39. How is ipratropium (Atrovent) given? 40. What is the dose of ipratropium given via MDI? 41. What is the dose of ipratropium given via nebulizer? 2.5 ml of 0.02% solution or 500 μg/unit dose vial. 42. How is tiotropium given? 43. What is the dose of tiotropium given? 44. What are the side effects of ipratropium/tiotropium? They are mainly local since they are poorly absorbed. 45. What receptors are non-selective antagonist of ipratropium bromide (Atrovent)? 46. How is ipratropium bromide administered? MDI HFA, nebulizer and soft mist: propellant-free (not available in US). 47. What is the onset of bronchodilation when using ipratropium bromide? 48. How long does ipratropium bromide take to reach peak effect after inhalation? 49. What is the duration of ipratropium bromide? 50. What is the dosage of ipratropium bromide via MDI? 51. What is the dosage of ipratropium bromide via nebulizer? 0.02% / 2.5 ml which gives 500 μg dose/treatment. 52. What receptors is a muscarinic receptor agonist for tiotropium (Spiriva)? 53. What receptors does tiotropium bind to? 54. Is tiotropium a long or short-acting bronchodilator? 55. How is tiotropium administered? 56. What is the duration of bronchodilation of tiotropium? 57. What is the dosage of tiotropium given? 58. What is the peak effect of tiotropium? 59. What is the brand name of glycopyrrolate? 60. How is glycopyrrolate administered? 61. When is glycopyrrolate given by inhalation? When there are large amounts of oral secretions that prevents care for the patient. 62. What is the duration of bronchodilation for glycopyrrolate? 63. What is the onset of glycopyrrolate? 64. What is the peak effect of glycopyrrolate? 30 min. – 1 hour. 65. What is the dosage of glycopyrrolate? 66. What is the brand name for Aclidinium bromide? 67. What kind of drug is aclidinium bromide? A long-acting inhaled muscarinic antagonist. 68. What are cholinergic effects? Decreased HR, miosis (pupil constricts), lens thickens, salivation, lacrimation (tears), urination, defecation, mucus secretion and bronchoconstriction. 69. What are anticholinergic effects? Increased HR, mydriasis (pupil dilates), lens flattens, dries upper airway, decreases tear formation, urinary retention, antidiarrheal (constipation), mucociliary slowing and bronchodilation. 70. What is ipratropium used for? Bronchodilation in asthma and COPD. 71. What is tiotropium indicated for? 72. Does tiotropium maintains higher or lower PFT levels than ipratropium? 73. What is the mechanism of action of anticholinergic bronchodilators? They block the effects of acetylcholine. 74. What are some examples of anticholinergic bronchodilators? Spiriva HandiHaler and Respimat (tiotropium), atrovent HFA (ipratropium) and Tudorza Presser (aclidinium). 75. What are the indications for anticholinergic bronchodilators? Asthma prophylaxis and maintenance treatment of COPD. 76. What type of inhaler is Spiriva HandiHaler? 77. What type of inhaler is Spiriva Respimat? 78. What type of inhaler is Atrovent HFA? 79. What type of inhaler is Tudorza Pressair? 80. What is the dosing interval for Spiriva HandiHaler? 81. What is the dosing interval for Spiriva Respimat? 82. What is the dosing interval for Atrovent HFA? 83. What is the dosing interval for Tudorza Pressair? 84. Are anticholinergic bronchodilators used to treat the underlying causes of asthma? 85. Are anticholinergic bronchodilators used to relieve an acute asthma attack. 86. What is the mechanism of action of anticholinergic bronchodilators? 87. What are some examples of anticholinergic bronchodilators? 88. What are the indications for anticholinergic bronchodilators? 89. What type of inhaler is Spiriva HandiHaler? 90. What type of inhaler is Spiriva Respimat? 91. What type of inhaler is Atrovent HFA? 92. What type of inhaler is Tudorza Pressair? 93. What class of drug is an anticholinergic? 94. Anticholinergic drugs are used for the primary maintenance of what? 95. What is the generic name for Spiriva? 96. What is the generic name of Incruse Ellipta which is approved for maintenance treatment of airflow obstruction in COPD? 97. What is the same as a cholinergic and produces the effect of Ach? 98. What is the combination of Albuterol and Ipratropium Bromide? 99. What two type of agents make up the Combivent Respimat? 100. What is the generic name for Tudorza Pressair? 101. What way is Ipratropium bromide administered? 102. What four things are Ipratropium Bromide indicated to treat? Allergic rhinitis, non-allergic rhinitis, viral rhinitis, and maintenance therapy in patients with COPD. 103. What three ways can the combination of Albuterol and Ipratropium Bromide be administered? 104. What receptor sites does Tiotropium Bromide exhibit selectivity for? M1 and M3 receptor sites. 105. When does the peak effect for Atrovent occur? 106. Is Atrovent beneficial for an acute exacerbation? No, because it is slow acting. 107. What three effects are caused by the use of anticholinergic agents? Mucociliary slowing, bronchodilation, and increased heart rate. 108. What five effects are due to cholinergic stimulation of muscarinic receptors? Bronchoconstriction, increased mucous production, contracting, salivation, and lacrimation. 109. What two things do quaternary ammonium compounds not do? Do not cross lipid membranes, and do not distribute throughout the body when inhaled. 110. What seven things could result from an inappropriately high dose of anticholinergic tertiary ammonium compounds like atropine? Disorientation, hallucinations, come, psychotic reaction, pupil dilation, lens thickening, and blurred vision. 111. What drugs competitively block the action of acetylcholine at parasympathetic postganglionic effector cell receptors? 112. What should be avoided by patients using Ipratropium Bromide aerosols? 113. What type of effect has little or no effect at all during the aerosolization of Ipratropium bromide? 114. What stimulates M3 receptors on airway smooth muscle, causing bronchoconstriction? 115. What is the most common side effect of anticholinergic bronchodilators? 116. What are side effects of administering Atrovent with an SVN? Flulike symptoms, pharyngitis, dry mouth, dyspnea, bronchitis, and upper respiratory infection. 117. What may cause pupil dilation? Activating an Atrovent inhaler in the eye. 118. What is the first line choice of bronchodilators for chronic obstructive pulmonary diseases? 119. What can Ipratropium Bromide be combined with for maintenance bronchodilation in COPD? 120. What is added to a beta agonist in severe asthma episodes? 121. What are examples of patients that may benefit from anticholinergic agents? Patients experiencing acute/severe episodes of asthma not responding well to beta agonists, patients with psychogenic asthma, patients with nocturnal asthma, asthmatics being treated for another condition with beta blockers, and an alternative to theophylline. 122. What are two effects of Atrovent being sprayed into the eye? Pupil dilation and lens paralysis. So there you have it! That wraps us our study guide on Anticholinergic Bronchodilators. I hope that these practice questions were helpful for you. If you truly go through these practice questions numerous times, I have no doubt that you will not only learn, but also retain this crucial information. Doing so now will help you tremendously in the present and for years to come. Thanks for reading, I wish you the best of luck, and as always, breathe easy my friend.